Azurite is formed only from solutions with high concentrations of the hydrogen carbonate ion (HCO3-). The presence of azurite indicates that the artifact corroded in the presence of elevated hydrogen carbonate activity (Neil and Little 1992). Is it possible, then, that increased carbon dioxide concentrations favored the formation of a blue azurite patina on the bronze statues at Delphi? In a very pure system, only the very low concen-3-tration of dissolved Cu2+ ions and the ion HCO must be considered. Even assuming a concentration of 6 vol% carbon dioxide at ancient Delphi, this would apply to a concentration of 2 x 10-3 mol CO2 per liter at 25°C and 4. 4 x 10-3 M at 1°C, calculated with the tabulated absorption coefficient for CO2 in water according to Henry's law (Plummer and Busenberg 1982). Unfortunately less than 1% of the dissolved CO2 reacts to carbonic acid (Stumm and Morgan 1981); thus the concentration of HCO3at a pH of 6 only reaches values of 8 x 10-4 and 1. 4 x 10-3 mol per liter for 25° and 1°C, respectively. These values were calculated by using the apparent dissoci-+-ation constant K1 equals; (H) x (HCO3) / (H2CO3*) equals; 4 x 10-7. The concentration of Cu2+ was assumed to be 10-4 M and lower according to experimental results by Fitzgerald et al. (1998). The following equilibrium diagram by Sikka et al. (1991) and Zheru Zhang (1994) shows clearly that malachite would have been formed at pH values of 6 and higher under such conditions (see fig. 2). The formation of azurite can, therefore, be excluded. This conclusion is corroborated by a multitude of observations on patinas. Azurite as a patina mineral has been observed only on copper alloys that have been excavated from soil. Such intergranular soil solutions may have elevated concentrations of the hydrogen carbonate ion, due to considerable concentrations of calcium hydrogen carbonate (Riederer 2003). An experiment one of the authors performed also showed that no azurite is formed in the pure system Cu-O-CO2-H2O. In this experiment a sheet of pure copper was immersed in distilled water saturated with 0. 1 MPa CO2 at 5°C. Some hydrogen peroxide was added to ensure slow oxidation, and the closed vessel was stored at 5°C. In a very sluggish reaction, only malachite was formed; the first visible green tarnish was observed only after some months. In another experiment a slurry of freshly prepared Cu(OH)2 was bubbled with CO2 0. 1 MPa at 20°C; within a few hours the blue copper hydroxide had converted to green malachite (Krings 1996). Similar Cu(OH)2 species can be assumed to be present as a very thin, perhaps monomolecular layer at the surface of CuO. It can therefore be concluded that an azurite patina could not be formed in a pure system Cu-O-CO2-H2O, even at greatly increased CO2 concentrations. Nevertheless, the occurrence of an azurite patina cannot be totally excluded at Delphi because azurite can form readily in natural environments if very diluted CuSO4 solutions react with Ca(HCO3)2solutions, which usually result from the dissolution of limestone by CO2-rich waters. A similar carbonate system was apparently present at the surface of the copper artifacts at Delphi. Indeed, Delphi is situated in a landscape of limestone bedrock; the building blocks were also made of porous limestone brought from the neighboring deposit at Kastri (De Boer and Hale 2000). Moreover, there is historical evidence of a vast rebuilding and restoration of the sanctuary during the reign of the Roman emperors Domitian, Trajan, and Hadrian (A. D. 90–135) (Bourguet 1914; Hammond and Scullard 1970). This is just the time when Plutarch was working at Delphi (A. D. 95–125) and when he wrote the dialogue De Pythiae Oraculis (A. D. 125). It is in this work that he mentions the blue patina of the Spartan Monument and also alludes to “so great, so vast a change” of the sanctuary, as well as the “many buildings added which were not here formerly, many restored which were ruinous or destroyed” (Plutarch 1918). Airborne calcite dust could well have been present, especially during restoration works within the temple precinct, since the stonecutters were working mostly on marble and calcite-bearing rocks. In this equation, the partial pressure of CO2determines the amount of dissolved calcium hydrogen carbonate (Ca[HCO3]2), as well as the amount of additionally dissolved CO2 in the system CaCO3-CO2-H2O (Stumm and Morgan 1981;Plummer and Busenberg 1982). This additionally dissolved CO2 has an important influence on the pH value of the resulting solutions. The solution is alkaline with a pH of "8 at very low partial pressures applying to approximately 0. 1vol% CO2, but higher values of CO2 in the atmosphere gradually shift the pH value toward the neutral and weak acid region. Moreover, the solubility of calcite, and thus the hydrogen carbonate concentration as well as the amount of additionally dissolved CO2, are enhanced at lower temperatures. A drop from 25°–1°C would cause an increase of approximately 50%. Figure 2 is calculated for 25°C, but the phase boundaries of this diagram would shift only very slightly for temperatures in the 25°–1°C range. Azurite growth can be expected on contact of such a solution adhering to calcite particles with solutions reported by Karlen et al. (2002) in the 5. 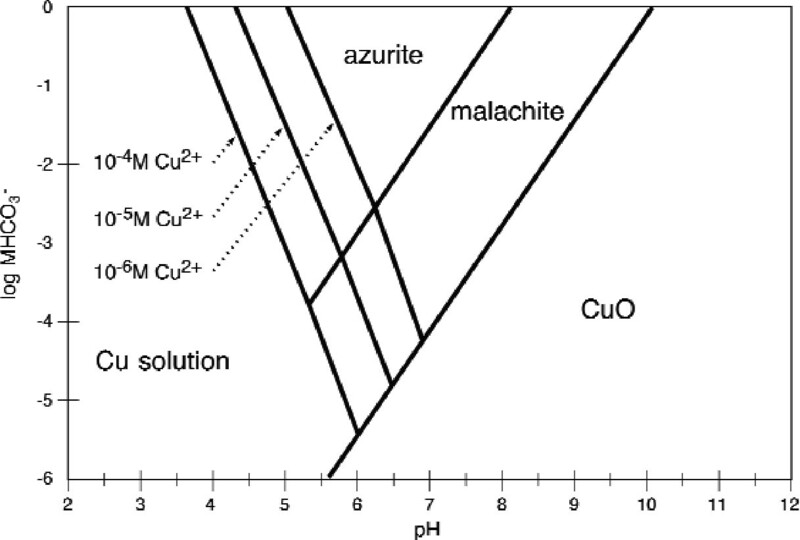 5–6 pH range and Cu2+ in the range of 10-5 M and lower. An optimal pH of approximately 6. 5 is approached in this way. So, we can expect azurite formation at CO2 concentrations in the 1–4 vol% range, the lower concentrations applying to low temperatures. Any formation of copper sulfates at such low SO42- concentrations can be excluded on the basis of calculations by Sikka et al. (1991). This is again corroborated by experiments of Krings (1996), who obtained azurite plus gypsum by the slow reaction of a 0. 004 M CuSO4 solution with a calcite crystal in the presence of an atmosphere with 50% CO2 at 4. 5°C. The SO42- concentration cannot exceed 1. 2 x 10-2 M in the presence of calcite due to the low solubility of gypsum.